To study all components used in adsorption refrigeration system. To study the working of thermal compressor. Thermal Compressor : Thermal compressor is divided in to two phases for two phase operation working in continuous mode. Principal of the thermal compressor is adsorption cooling system based on Heat & Mass Transfer operations. Thermal compressor is designed for 0.5 T.
capacity. 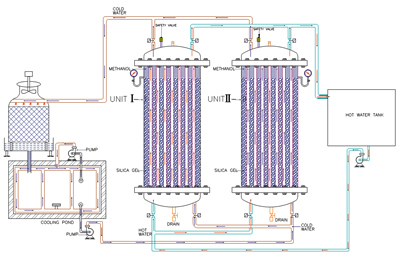 Evaporator and Condenser are separately incorporate in main chamber of Thermal Compressor. Monoblock : 1 HP, three phase, 50 Hz monoblock for condenser water circulation pump. Water Piping : Water pipe lines and fittings to interconnectwater line of condensing water. Steam Generator : Steam Generator of 40 lit capacity & pressure 1.2 kg/cm2. Cooling Tower : 300 Kcal/hr. Water Supply : @ 160 LPM with 20 mtr. head.